Kamal Mani Dixit, who passed away in Kathmandu on 29 December at the age of 87 was the closest Nepal came to having a Renaissance man. He was also one of those rare Nepalis who was a front-row witness of Nepal’s tumultuous modern history as it unfolded in his life time -- from the absolute rule of the Ranas in the 1940s to the overthrow of the oligarchy in 1951, from King Mahendra’s dissolution of a popularly elected government in 1960 to the set-up of a constitutional monarchy in 1991, from the Jana-Andolan III in 2006 which turned Nepal into a secular republic in 2008 to the promulgation of the seventh Constitution in 2015. Dixit was comfortable being himself in times both good and bad, taking all these changes in his stride, and lived a life filled with literary joys, and devoted to public service, philanthropy and to the causes of free speech and democracy. Born in Gairidhara in Kathmandu in 1929, Dixit grew up in a family that had modest financial means but prized, as was common then among Kathmandu’s upwardly mobile Brahmins, religion and education. Dixit had earned his Bachelor’s from Banaras Hindu University and had started working in Kathmandu when his family came upon wealth, mostly in the form of land near Patan Dhoka, through the bequest of Rani Jagadamba Rana, whose wish was that the wealth be put to use in perpetuity to serve the public, and for the public good. Rani Jagadamba could not have found a more scrupulous and creative steward of her trust, for Dixit spent the next six decades putting the inheritance to benefit the public starting with the fields of education and Nepali literature. Dixit managed Madan Memorial Girls’ School in Lalitpur, and started and ran Madan Puraskar Guthi, which not only oversees the go-to archive for Nepal’s literatures, but also awards the prestigious Madan Puraskar to writers annually. 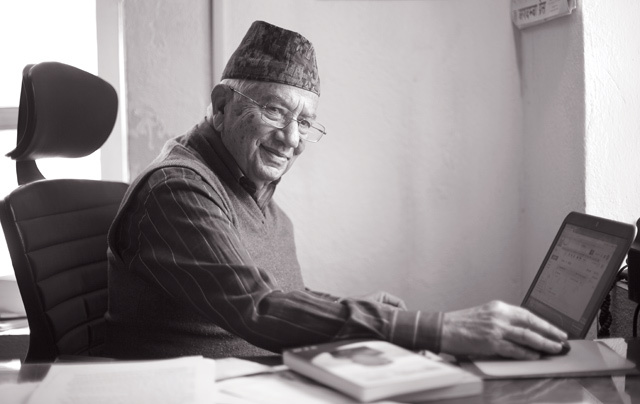 A man whose devotion to Nepali language and literature knew no bounds, Dixit started and edited Nepali, a literary quarterly, and authored 75 books that ranged in subjects from contemporary essays to historical narratives to commentaries to memoirs to criticisms and mordant social observations. His writing style bore the hallmarks of clarity, simplicity, wit and self-effacement -- all of which he used to great effect to let ideas, observations and memories play out in the public sphere. Moreover, working closely with a wide cast of writers, linguists, poets, playwrights and historians, he edited and published 22 books on poetry, religious epics, dramas, songs and stories. Through his lifelong literary pursuit, he helped bring many obscure and neglected but immensely talented Nepali authors and their creations to light. By doing so, he cemented his reputation as the trusted custodian of Nepal’s literary outputs, so much so that he even found time to translate and write children’s books, regularly teaching, as he did in his 80s, a much-loved course on metrical lines (chhanda) of classic Nepali poems to students at Rato Bangala School. Literature and commerce often do not go together, but by dint of his personality, wide-ranging interest and influence, Dixit served ably for many years as a member, respected manager, board member and owner of enterprises as diverse as, but not limited to, Sajha Yatayat, Nepal Bank, Salt Trading Limited, National Finance and the Rotary Club. Everywhere he served, he could be relied on to provide shrewd observations, wise counsel and lively meetings that quickly got to the heart of the matter. What I remember most about Dixit was his child-like curiosity. He took genuine interest in people and ideas, and gently asked question after question until he understood whatever there was to learn. He started using email in his 60s, and Facebook in his 80s. On learning that there was no universal flatform for Nepali script on computer, he oversaw an effort to promote the Nepali Unicode script, which has made it easy for all Nepalis to communicate electronically in Nepali with one another. Many years ago, Aristotle wrote about the kind of eudaimonic or engaged life one should consciously strive to live, the kind of life which is ‘lived the way you would like to have lived till the moment you die’. Dixit, who was affectionately known as Dadaji, was revising and fussing over the content of a book just two days before he departed -- leaving a richly public-spirited legacy that is at once quietly inspirational and hard to emulate. Consolidating the countrys 75 districts into 25 is the only way to make them economically viable and truly decentralised.